Denver, CO – The same exhaust fans that are keeping your commercial kitchen comfortable and protecting the area from overheating may also be creating air imbalance problems throughout your establishment. Because the size, design, door and window placement of every building varies, the mechanism by which the atmosphere of your restaurant can best be corrected is most accurately established by an HVAC professional. They can provide what is called an air make-up service, which essentially replaces the air lost through hood fans with a special unit, which avoids some of the problems which present themselves when air from other areas of the home or building replace that lost air. If the exhaust fan was not installed/incorrectly installed, or simply, if the makeup air from the fans is not enough to replace the air exiting from the stove area, negative air pressure can occur. Negative air pressure creates a sort of vacuum in your space, where windows and doors can shut suddenly, dust particles can settle fast onto surfaces or food, and whistle-like noises can also persist when air is let out or into the space. These are very undesirable conditions for a dining or cooking area because of hygiene reasons as well as the disruption of ambiance this can create. With negative air pressure sucking everything back into your space, the gasses that are supposed to be going out from your chimney will actually come back in, creating a health hazard. This can set off carbon monoxide detectors and threaten the safety of your patrons and employees. The exhaust hood, unaided by the sufficient amount of make-up air, will–in turn–not be able to process the amount of air it was designed to handle. Over time, you will notice a buildup of grease and grime on your kitchen surfaces. Also, unpleasant cooking and other smells will seep into all the space pockets of your building, including the dining areas, where patrons are trying to enjoy their food! Insufficient replacement air in your kitchen will encourage the air from outside to be absorbed inside. This ends up throwing the heating and cooling conditions out of balance, when your heater or air conditioner tries to counteract the problem. Your establishment will probably run too hot or too cold at all times, causing freezing or condensation and never really achieving a comfortable state. You, as the restaurant owner will only get a higher energy bill and a big headache trying to figure a way to finally stop this air imbalance problem. However, the problem is one for the professionals with a good diagnostic system that needs to be applied in a customized manner to every restaurant space with the care each one deserves. 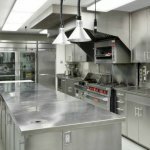 For help with replacement air in your Denver-area commercial kitchen, contact APS Hoods today.